Let's show off a bit of what this issue will look like. People have seen Klaus Scherwinski's fully finished and colored covers before, but since he's doing full art on this book, we thought it'd be fun to show you what his art looks like before he works his magic on the colors. Next week' we'll show off his throwback variant cover and the whole process that went into creating it. Looks like Wheelie is Magnus' "gofa". I wonder, is Magnus a "Peace Officer" here or still part of the Autobot Chain of Command? Who'd have thought that ANYTHING to do with Wheelie would be as fascinating as this?? it is fascinating isn't it. looks like he's about to get trampled. i love that IDW have NO "house" style, and let their creator's go for broke, because this small panel shows that Klaus has a totally different style but it still suits TF. Rockin. Dang, that's really nice. I like seeing different people get to do TF art so it doesn't all feel DreamWave inspired. 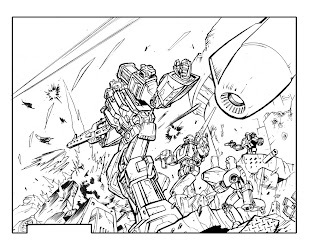 I'm especially fond of Nick Roche and Josh Burcham (you should let josh do a Spotlight, man!). Also, any chance of getting Geoff Senior to do a Spotlight? Yes, more Geoff Senior, please. This is looking to be a rare (in the world, not in IDW, who always gives us quality) treat. I'm loving the look of Klaus' style! I have a feeling we're gonna get another S: Kup experience with this one. If we can ever fit a good Burcham Spotlight in, I'd be all for it. Geoff Senior, I've tried him before but he wasn't interested in doing a full 22-page book. Well, not uninterested as much as too busy with his current advertising work. How old am I turning on April 2?